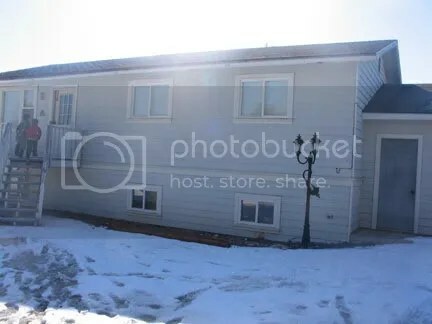 This is not the best picture of the house, but if the Lord wills, this will be our home! 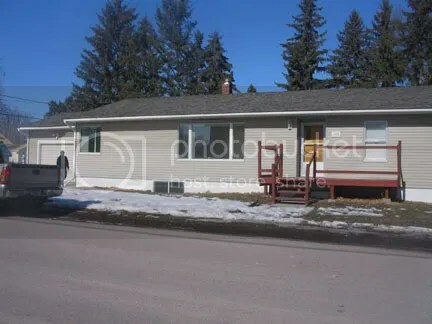 The bank (the owner) accepted our offer on this house this morning! Anyhow, now it is on to the next issues, the inspection is on Monday and the fact that we have to get everything done before March 28th! I have a feeling I am going to be on the phone alot! I was on the phone 35 minutes with a insurance agent earlier! <p> Our mobile home is sold also so we are packing now. My goal is to pack 5 boxes a day……I only got two packed today, so not quite up to speed! Well, we had two birthdays this week! My two oldest boys are growing up so fast. They constantly amaze me everyday in all they do and say. I am so proud of them! 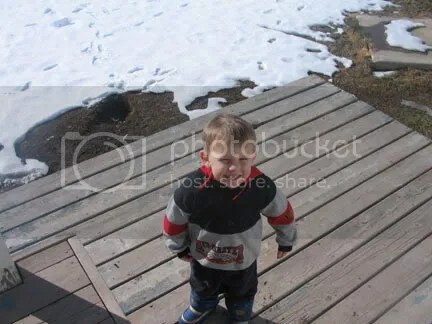 <p> Since they have birthdays close together and we have a large family, I was trying to think of something fun, active and not expensive this year. My nephew also has a birthday next week so we decided to plan a birthday party together. 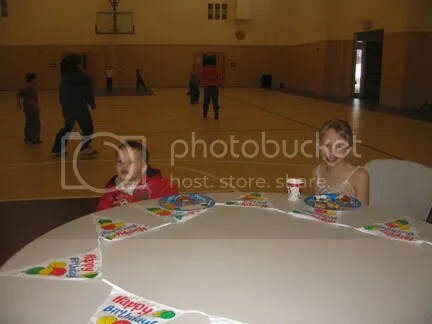 The idea came to us when a friend mentioned the church rented out their gymnasium at times for birthday parties! It is winter here, wet, muddy/snowy, so they have not gotten alot of running time in. <p> The gym was rented for only $20 which my sister and I split, we brought some simple snacks like pretzels, carrot sticks and dip, cheese and crackers, flavored popcorn and did root beer floats instead of cake. <p> They had so much fun! It was great because it was a party the men came to and played with them and not much planning for games etc. There were balls, nets and plenty of space to run, shout, play and do whatever! It was the best party ever, my boys told me! <p> Root beer floats were really cheap, I bought a huge 3 liter pop bottle of root beer for $1 and half gallons of ice cream for $1.25 each. We had over 23 children and maybe 10 adults and used two things of ice cream, I think! 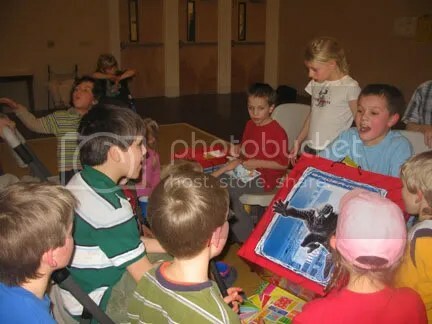 <p> It was a great way to have a birthday party where everyone had alot of fun and we did not all have to pay high amounts of money, but just old fashioned fun with lots of running, jumping and lots of tired children at the end! 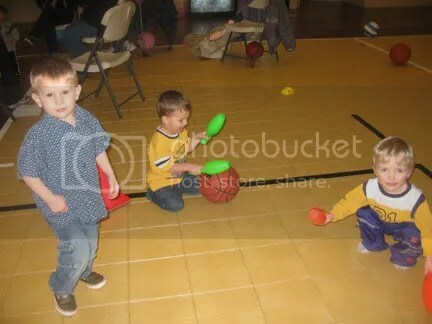 Three three year olds…..The one standing is my youngest son, the one with the green bowling pinsm is my nephew and then a friend! Three eight year olds! My son, my niece and my youngest brother! I had P. draw the winner as it is his birthday!! And the winner is……..Moriah!!! Yay!! I don’t even have to add one more thing to my list of mailing it! Thank you for all who entered and check back for more drawings and book reviews. We have a great marriage book later this month coming up and I won the copy of Passionate Housewives so I will probably be reviewing that. I am trying to plan some meals, but this last week was sort of crazy so our meals were all messed up! I still want to try some of the ones we skipped though. We did put an offer on a house last week, since it is owned by a bank we have to be very patient and we may not hear for a couple more days. <p> We have been sort of racing around like chickens with heads cut off the last week, first looking at houses, then the offer, painting our house right now and trying to make things look nice. Things were completely torn apart today still. <p> First we painted the hallway, next the boys room, so some of the stuff from their room was in the living room, it was all torn apart and of course you discover broken pieces of crayons, torn papers, dirty clothes shoved places etc. so it was a adventure! It looks wonderful though! Then F. started on the living room, but it still had furniture from the boys room, the living room curtains, pictures and furniture had to come apart too so things were just a disaster. <p> Thursday we did the house offer, Friday I had a service project instead of bible study which was great, had to run some papers around town, and had a MOPS things in the evening which was very nice (a hot chocolate bar….very fun), Saturday we had a church ladies tea fellowship at Perkins and then at 4 pm. I had a birthday party for my two oldest sons and my nephew. Sunday I was in the nursery at church. In the meantime, we are trying to put our house back together with the paint and the normal dishes, laundry etc of life. <p> There has been some trying moments, but I am really amazed at the peace I have. A couple of times I felt this panic starting to come, but a really wonderful assurance in my heart that God is control of everything has been really a neat blessing. This is one of the biggest things I have done in my life, I think right next to getting married, so I really appreciate prayer. It has been good for me to stop and pray so many times and just trusting that really God knows where we should live, what we will find, how we will work things out etc. <p> I know this is not to say i am not going to have those panic moments, but God is control! I have a long list for tomorrow and I am sure the next day. I am not sure how much bookwork we will get done, hopefully we can finish up P.’s math book this next week though and our reading soon after that. I am going to have him reading lots of library books, I think this next while! <p> I am up late making a coffee cake dough for MOPS tomorrow and waiting for my boys to get home. They went with my mom yesterday and it is a long dark ride home with my sister. Check back to see more pictures of our painting and maybe we will be back out looking at houses again, who knows? This house was really cute, but sort of tiny upstairs. The kitchen and dining room especially. This is the living room you walked into. It had a pretty fireplace in it. 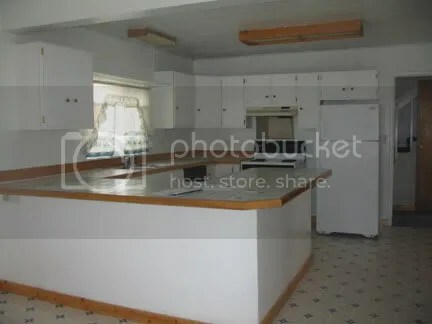 The kitchen was sort of skinny, but not too bad! So, take a look at all the pictures and tell me what you think. The one with the big tub and the blue and white one are our favorites so far. 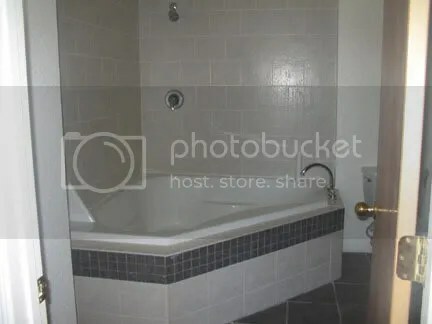 The one with the tub would be a possibility if they go down more in price. So, we will see! It will be a great house, but it is being remodeled and not done at all. I don’t think it will qualify for the loan we have. A big smile! The yard was beautiful! 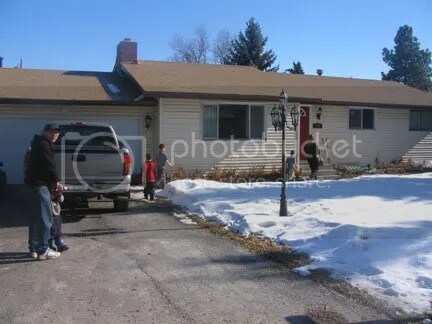 It backed up against a park and had a nice double car garage, full basement and beautiful brand new kitchen! I could not get whole house in the picture! The front is a little close to the street, isn’t it! 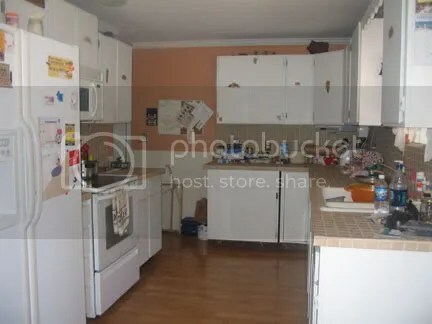 This is the kitchen. There is not too many cupboards or counters and no stove or fridge right now. 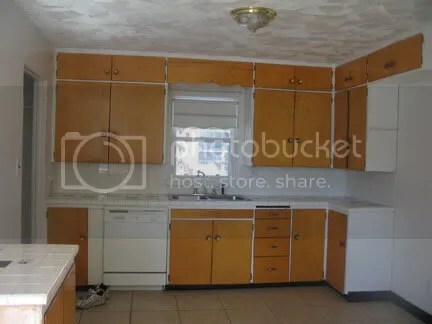 There is a small half bath off the kitchen. A dining room and large living room is behind me. The best part of this house! This is the Master bath. There is a walk in closet also in the master bedroom. The floor is laminate or wood, I was not sure. 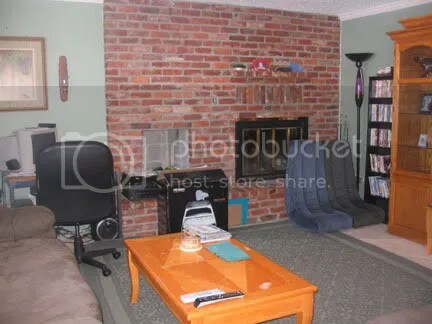 There are two very huge bedrooms in the basement and another smaller one next to the master. There is another full bath in the basement and a laundry room. <p> We are thinking of placing an offer on this one. It is across the street from the other one we like. This is one we looked at the other day and walked through again a second time as we really liked this one. it is a option on our list. 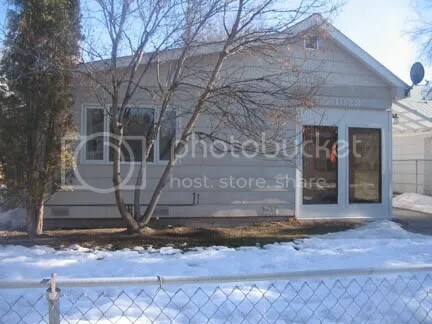 It has a large back yard, 4 large bedrooms upstairs and one possibly office/playroom downstairs. 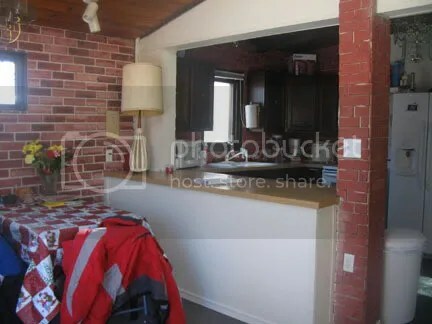 A large family room (like 20 x24) and 2 bathrooms. 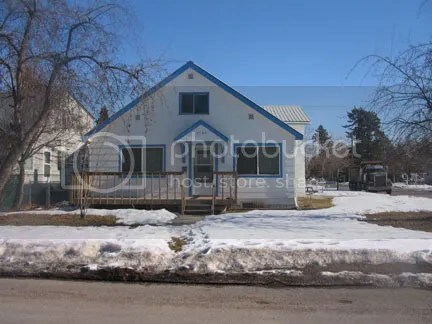 The cons about this house are not too many, but the carpet is all blue. The ceilings are low upstairs in three of the bedrooms and the bathroom upstairs and no flooring in the one room downstairs, no garage. There are lots of pros! This was a cute little house, with some old fashioned stuff, but it was a little small for what we were looking for. 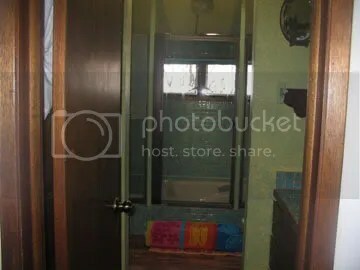 This had the most interesting bathtub and shower that I have ever seen, It was hard to get a good picture of it. It had the oddest color tile and then a pinkish tub that you climbed up and then stepped down into! 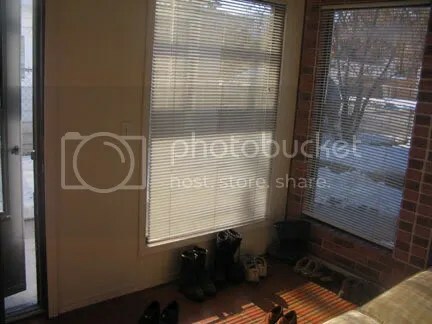 This was the nicest little sun room that you entered into! It was really neat looking!